Aesthetically, the natural, fresh, dark color creates contrast, which enhances the overall perception of your landscape’s greenery. However, as “they” say…sometimes good things come to an end. In this case…like when your mulch catches on fire! Mulch is a combustible material. It can be easily ignited by improperly discarded smoking materials or by spontaneously combusting. Hundreds of small and large fires are started this way every year. The risk is that what starts as a small outdoor mulch fire can quickly spread to buildings. A mulch fire can be well underway before someone notices or is alerted by smoke alarms or sprinkler systems activating. Care must be taken to prevent mulch fires. Mulch that is piled too deeply, more than a few inches, can build up heat and spontaneously catch fire. Factors such as below-average rainfall, dry conditions, warm temperatures, and high winds increase the risk of mulch fires. 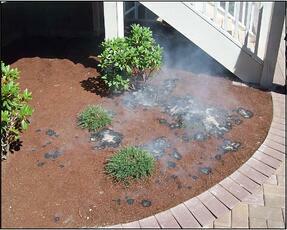 Disposing cigarettes irresponsibly in and around mulch can cause it to catch fire. Put It Out. All the Way. Every Time. If you smoke, remember to properly dispose of all smoking materials. Always use appropriate receptacles for disposing of smoking materials and matches. Be a responsible smoker (see above). Regularly water your plants and mulch to keep them consistently moist. Install less flammable mulch like shredded hardwood or pine bark nuggets. Provide fire-proof receptacles in public places including entrances around your commercial property. Do not install mulch deeper than 3 inches. Add a 2 to 3 foot rock bed around your building creating a barrier between the mulch and your property. If your mulch does spontaneously combust or catch fire for some reason, this will keep you, your employees or residents along with your property safer. Most importantly, if you see anything smoking in a landscape bed, put it out if you can and report it. If the burning material is not thoroughly wet or removed it can re-ignite. Report any smoke or fire by calling 9-1-1. If you have any further insight on how to help prevent mulch fires, please add a comment below.